United Aircraft Corporation has offered to set up joint development and manufacturing facilities in India. Russia is keen to enter a partnership with India in its initiative to design and develop a regional transport aircraft, PTI said on Sunday. United Aircraft Corporation (UAC), Russian state-owned civil and military airplane manufacturer, offered to set up joint development and manufacturing facilities in India, the news agency cited officials as saying. The offer was made during a recent visit of Indian External Affairs Minister Salman Khurshid to Moscow for the Intergovernmental Commission meeting on Trade, Economic, Scientific, Technological and Cultural Cooperation, the news agency said. According to the report, UAC officials made a detailed presentation to Khurshid’s delegation highlighting areas for future cooperation which includes joint development of passenger aircraft and helicopters. UAC is the manufacturer of a range of aircraft from the Sukhoi Superjet to the 436-seater IL-96-400M plane besides a wide variety of fighter jets for the armed forces. 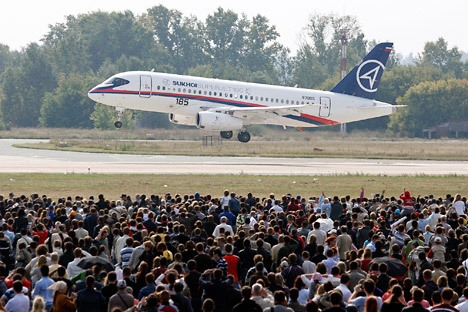 The Sukhoi Superjet 100 (SSJ 100) could be of particular interest to India. It is a modern, fly-by-wire regional jet in the 75- to 95-seat category. With development starting in 2000, the airliner was designed by the civil aircraft division of the Russian aerospace company Sukhoi in cooperation with its main partner Boeing. Designed to compete internationally with its An-148, Embraer and Bombardier counterparts, the Superjet 100 claims substantially lower operating costs, at a lower purchase price of $35 million. Russian officials feel that co-production of civilian aircrafts with India would improve commercial prospects of its aircraft in the Indian market, according to the PTI report, which was on India Today’s website. India has set up a National Civilian Aircraft Design Bureau, which is working on the preliminary design of the project, the news agency said.